High-quality loose liner butterfly valves are designed in accordance with EN 593 and feature extended necks for insulation. The valves are semi-lugged. ventilation as well as fire fighting and agricultural applications, the valves are in accordance with ISO 9001. Face-to-face dimensions are to EN 558/20 and DIN 3202/K1 and rated at PN16 and PN10 (DN250-300). 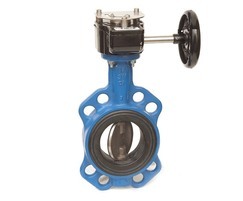 The butterfly valves are supplied in a blue (RAL 5017) powder-coated finish to 12944-2 for category C3 medium. With anti-blow-out shaft and bi-directional tight shut-off, the valve is highly safe to operate and maintain. The valves are tested according to quality procedures that comply with international standards, such as ISO 5209.